Welcome to the Robo-One Workshop! This workshop is an IAP class offering open to all MIT students (both undergraduates and graduates). Students will spend several weeks building and programming a commercialized humanoid robot for an exciting exhibition at the end of IAP. 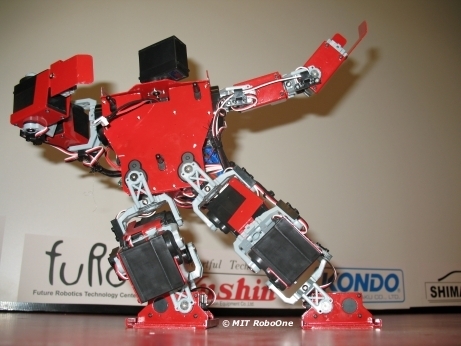 The goal of the workshop is to give students hands-on experience with tackling humanoid robot control problems, such as stably walking on flat ground, walking up stairs, running, and even fighting! The class will introduce basic techniques which include: driving servo motors, incorporating sensory information, and programming a single board computer. Additionally, introductory lectures will briefly review the state of the art in humanoid robot control techniques, much like those found in Honda's humanoid Asimo. Click here to see a video taken during the IAP'08 competition. In this year's exhibition students will showcase their robots and attendees will have an opportunity to interact with both students and their humanoid robots. As the course matures in future years, our goal is to bring the final IAP exhibition closer to the exciting RoboOne competition held in Japan. See course info for more information.